This Irish throw will add a bit of Celtic decor to your home. 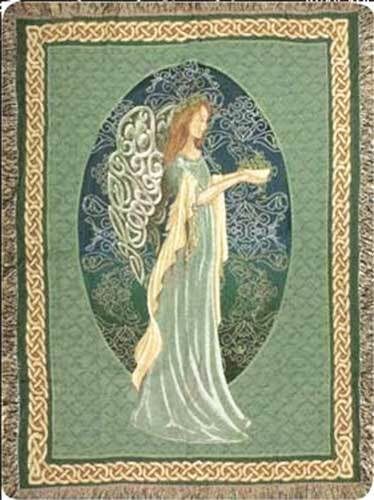 This Irish throw blanket features an angel with Celtic knot wings along with a knot-work border and shamrocks. The Celtic themed blanket measures 51” wide x 68” long and it is woven of 100% cotton in the United States. This enchanting tapestry throw is fashioned in a refreshing spring green and it is received with Celtic knot and shamrock history cards, complements of The Irish Gift House. Irish blanket is a double layer throw that features shamrocks on both sides. This double sided Irish blanket features green shamrocks on one side and cream color shamrocks on the other side. Celtic cross throw is a cotton blanket that features knot-work.